The long haired dachshund is thought to be the smooth haired dachshund crossed with breeds like spaniels or German Stoberhund. After a win at Crufts in 1923 the long haired were given the respect they were due. In America the long haired were mainly kept as pets until 1931 when the first long haired was registered with the American Kennel Club (AKC). It was not until 1940's that the Best in Show winner was a long haired. The coat of this variety of dachshund is similar to an Irish setter very slightly wavy, soft and shiny, longer on the underside of the body the ears and behind the legs, the hair should be the longest length on the underside of the tail forming a flag, shortest hair is down the dogs back. If there is very thick hair on the paws, this is called mops and is seen as a fault. Because of their long coats they were not suitable for go to ground hunting so were used as bird dogs. To maintain the long coat in top condition, groom regularly and trim as required - see grooming dachshund. 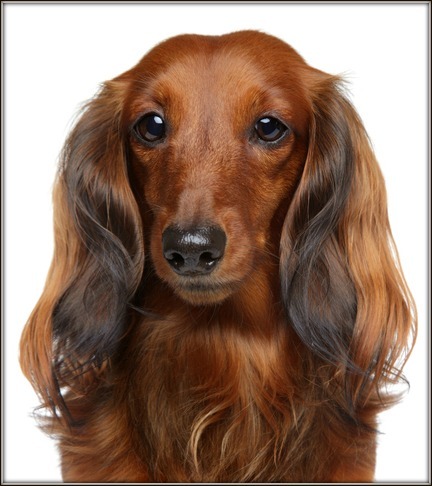 The long haired is one of the three coat varieties of the dachshund dog, the other two are the Smooth Haired and the Wire Haired each with there own characteristics. Some say that this type of dachshund is the quieter and gentler, of the three varieties, but this depends on the individual dog, the long haired is also the aristocratic of the dachshunds with a dignified appearance, charming and affectionate nature. 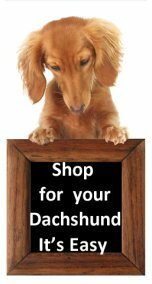 The long haired doxie comes in an assorted range of colors and patterns from one colored, red or cream or two colored including chocolate, black, fawn and grey, dappled or brindle pattern.